The 60 g/m² SwissWool® lining and robust nylon ripstop shell of the SwissWool Piz Boé Jacket make it ideal for ski tourers who know that less is more: less weight, less volume, but more performance. 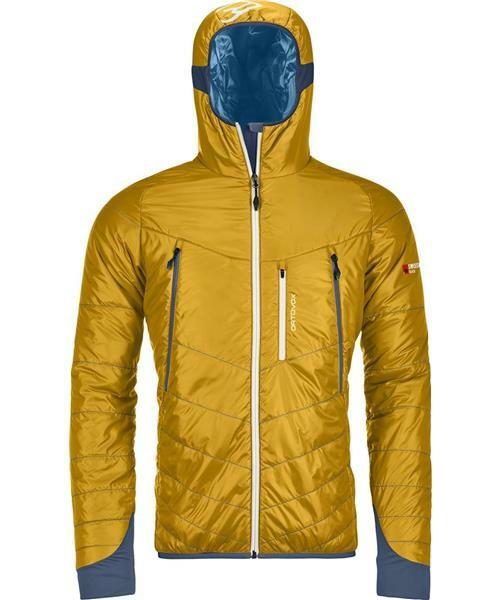 To underscore the “high-tech” aspect of this ski touring jacket for men, Ortovox used new elastic Merino Naturetec Light material in the underarm areas – exactly where breathability and freedom of movement are needed most. The tight-fitting, elastic hood and elastic waistband and cuffs keep the wind and cold at bay on freezing summits. The two front pockets and the breast pocket are positioned for optimum access even when wearing a backpack or harness, and can even accommodate larger objects. What’s more, the Piz Boé Jacket has an athletic cut: The lightweight insulating jacket thus follows your movements on ski tours and fits perfectly under a 3L hardshell jacket. * SwissWool®- Born out of a pioneering spirit and shaped by innovative strength, Ortovox introduced the first SwissWool® products in 2011 – and simultaneously created a new segment of insulating wool products! Wool offers excellent thermal properties and optimum climate comfort. In addition to high functionality, SwissWool® is also characterized by its regional origin, as well as its sustainable production and processing. * Pertex® Quantum is the outer material for all SwissWool Light and SwissWool Light TEC products. Pertex® Quantum uses a particularly tightly woven structure, which results in an extremely windproof and abrasion-resistant material. At the same time the material is soft and light.